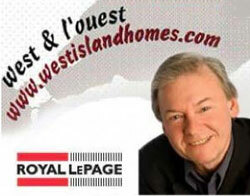 Grant Staley's - Royal LePage Village- Real Estate agent for West Island Homes. We are a premier Montreal real estate that offers extensive real estate information, buying and selling guidance, tips on environ-mental home strategies, community profiles and neighbourhood insights as well as current homes for sale in the West Island and areas west of Montreal. We service West Island communities Ile Perrot, N.D. de L'ile Perrot, Pincourt, Vaudreuil-Dorion, St-Lazare, Hudson, Rigaud, Les Cèdres, Les Coteaux and many other off-island communities. Grant Staley is a chartered real estate agent / Agency and key partner within the Royal LePage Village franchise network. 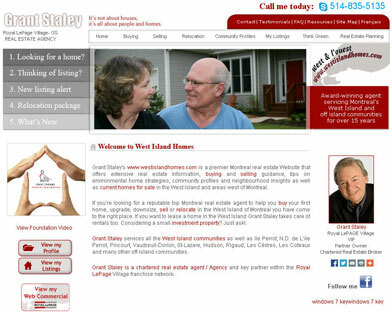 Grant Staley is a reputable top Montreal real estate agent to help you buy your first home, upgrade, downsize, sell or relocate in the West Island of Montreal you have come to the right place. A program to provide solutions for lifestyle changes and retirement living. Real Estate Planning helps you identify your motivation for moving and then assists you in making the correct decisions to meet your future needs and lifestyle. The Royal LePage Real Estate Planning program identifies three underlying reasons for moving: A: lifestyle changes B: financial considerations and C: unexpected situations. You may be able to identify with more than one of these three categories.